Don’t like the acidity of vinegar? Splash verjus on your salad instead. Photography by Sarsmis | IST. WHAT IT IS: The fresh juice from wine grapes that has not been fermented into vinegar. WHY IT’S DIFFERENT: It provides tartness without the acidity. WHY WE LOVE IT: It’s distinctively delicious and very low in calories. WHERE TO BUY IT: Shopping Information. *Viticulture emerged in areas of the Mediterranean Sea between 3000 and 2000 B.C.E. We don’t know who first made verjus, but the Roman name for it was acresta. †Vinegar can be made from the fermented juice of almost any plant, although wine from grapes is used in Europe and the U.S. Since verjus is fresh juice, there’s no alcohol, no fermentation. It’s a find for people who avoid those types of foods; it’s a real find for food-lovers seeking new tastes. 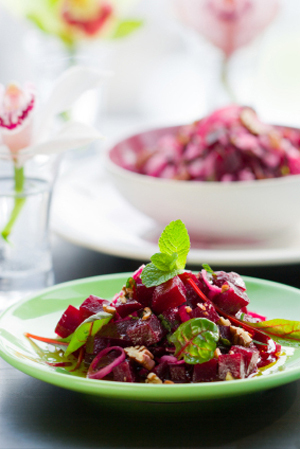 And it’s not only a healthy and low-calorie ingredient, it’s also wine-friendly. For aficionados who have been unable to enjoy a glass of wine alongside a salad tossed with an acidic vinaigrette, here’s the solution. While both verjus and vinegar can be used on salads, in sauces, in cocktails and other recipes, there’s a world of difference between the two. Vinegar is highly acidic with a very tart flavor. Verjus is without harshness. It provides gentle acidity and a flavor that is sweet-tart, bright and fresh-tasting, like citrus. We predict that after you’ve discovered verjus, you’ll be splashing it on, and in, everything. Read the full review, which includes recipes and two verjus brands you should know about. Start with the article index below. oils, vinegars and salad dressings. 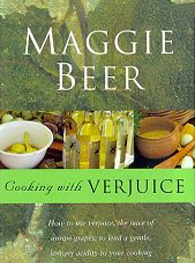 Cooking with Verjuice, by Maggie Beer. After working for years to perfect her verjuice, Ms. Beer reveals all you need to know about verjuice, the English spelling of verjus. Learn more. 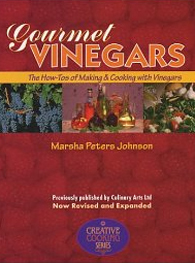 Gourmet Vinegars: The How-To's of Making and Cooking with Vinegars, by Marsha Peters Johnson. Make gourmet vinegars at home using a base of distilled vinegar. Learn more. 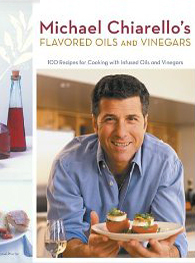 Michael Chiarello's Flavored Oils and Vinegars: 100 Recipes for Cooking with Infused Oils and Vinegars, by Michael Chiarello and Karl Petzke. Add pizzazz to your food with these easy ideas. Learn more. There’s life beyond Tabasco: Try these complex-flavor, artisan-made hot sauces. If you’re a fan of gazpacho and/or Bloody Marys, you’ll love this savory sorbet. There’s no sweetener, so it’s very low in calories—and high in healthiness.